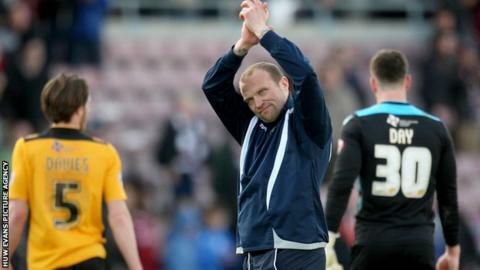 Newport County's players are all playing for their futures at Rodney Parade, boss Warren Feeney has warned. Only three of the squad, goalkeeper Joe Day and strikers Lenell John-Lewis and Tom Meechan are contracted beyond the end of the current campaign. "The players are fighting for their futures you know, they really are," Feeney told BBC Wales Sport. "I want to start thinking about next season now and as soon as we are safe, I will do that." Newport are 12-points above the League Two drop zone with six games remaining. Victory at the weekend over Cambridge United would secure their safety if York City fail to win. However, Feeney is already turning his attention to the summer when the Exiles could be in a similar position to last year when then manager Terry Butcher saw 12-players depart on the same day. Following four successive defeats in League Two, Feeney admits his players need to catch his eye. "Unfortunately, it's not like the Premier League, outside the Championship it is a different reality, people have mortgages to pay," he said. "The players are firstly playing for contracts and secondly, they never know who is watching them. "I expect hard work for 46 games, but I only have three players definitely staying next season, so there can be no drop-off. "Once we are in a position where we can't be caught, I want to talk to the players. "I'm sure they will appreciate knowing their futures."